Intro: 3,636 miles. That’s how far Glasgow, Scotland and Durham, North Carolina are apart from each other. Current OHMA student Rebecca McGilveray reflects on Nishani Frazier’s recent workshop and one of the things that unites these two places – the issues surrounding displacement. Glasgow is a city that is changing – and I’m not talking about the changes since the 1960s, when deindustrialisation put a generation, a whole city, out of work. I’m talking about the changes that I have seen – not just read and heard about – in the last 5 years. I am 22 and I was brought up in Glasgow during the city’s “rebranding” as a city of style and culture – it was out with the old and in with the new across the city. When Nishani Frazier presented “The Sounds of Blackness: Space & Sound Preservation as Oral History Advocacy” her descriptions of the methods of displacement and the process of gentrification were not abstract to me. She learned about these methods by observing her own home, as well as conducting archival research, which included oral histories. In all this she saw a pattern in how people were being displaced. When Frazier spoke, I could visualize the outcome of the methods clearly, vividly and painfully, because I wasn’t just imagining their effects in this place she described; I was remembering them in my own back garden: Partick, in the West End of Glasgow. I invite you on a journey through this “Dear Green Place” (Scottish Gaelic for Glasgow) that I call home as I illustrate to you what it feels like to see it change from an area built by and for the working class into something else. Afterwards, check out the interactive map to see and hear about some of the places I’m describing. Nishani Frazier outlined “Landmark Targeting” as an introductory method of displacement by which developers strategically target buildings of community significance, take them over and change them. Disturbing the sanctity of these local hubs effectively “crack[s] open”, as Frazier describes it, the area for redevelopment. What this results in is the destruction and erasure of community memory. 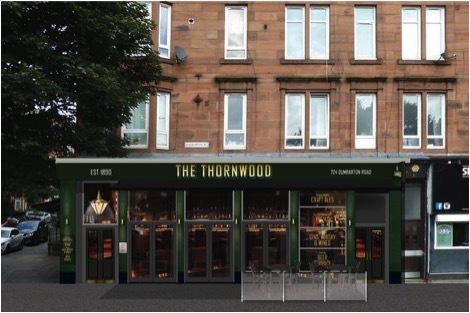 The Thornwood Pub sits at the top end of Dumbarton Road. Up the adjacent hill is the tenement where my grandmother lived and brought up 3 children and where I spent a fair amount of my childhood. The pub was recently bought over, with the intention of turning it into – as a local news outlet put it - “a traditional, premium pub with a contemporary twist and family friendly atmosphere” in an area that is viewed as up-and-coming. The pub I knew catered to an older clientele, former shipyard workers who would come together and reminisce about simpler times. By marketing the pub as “premium” and “family friendly”, the developers are forcing the older generation out of a working-class space, replacing them with a younger crowd. By not making an effort to blend and integrate the old and new, Partick loses a space where community memories were shared, local history was passed down and working-class lives were lived. There are barely any photos of the pub as it was, there are no videos from inside or out. According to the internet, The Thornwood never existed before 2017 – but the area has known the pub since 1890. An irony: that detail is now plastered to the rejuvenated façade. Frazier then outlined the expansion of university campuses as the next method of displacement. It does exactly what it says on the tin: the footprint of the campus grows and so too does the market for student friendly housing, bars, restaurants and cafe. Frazier’s insights brought to mind the oral history work of the Marian Cheek Jackson Center for Making and Saving History, which seeks to preserve the stories of Northside residents whose community is gentrifying due to the expansion of the UNC Chapel Hill Campus - and weaponize them as a way to resist displacement. In the last 5 or so years the University of Glasgow has expanded into land that once belonged to the Western Infirmary. Under the immaculate guise of advancing education, the University encroaches further into the working-class neighborhood of Partick. The result of this is a boom in artisanal bakeries, upcycled furniture shops and rustic coffee shops – promising to serve you lentil soup just like your granny made, while pricing her out of the neighborhood she has called home for years. When Scotway House – the former offices of D.W. Henderson’s Shipbuilders and a building of historic significance – mysteriously caught fire in 2016, I could hardly say I was surprised. The landmarked building had stood abandoned for 20 years, marooned in expansive wasteland between the river Clyde and the motorway, surrounded by the Glasgow Harbour development – luxury flats on one side, the new Riverside Museum on the other. Every time my father and I drove past the listing shipyard offices, we remarked that it wouldn’t be long before developers would be after it. The people of Partick were sad to see a historically significant building destroyed, but even more so to see yet another upscale development take its place – this time “student housing” that local students can’t afford – when that land could have been reclaimed as affordable housing for the whole community. Frazier wasn’t able to get absolute proof of arson from the archives or research, absolute proof that “criminal activity” was a reason for displacement – but the suspicion and allusions to foul play made it impossible to discount it as an official category. So that’s what I’m doing too. I have no solid proof that Scotway House was deliberately set on fire – but ask anyone in Glasgow and they will tell you the same as me. I’m not saying change is a bad thing – but as Nishani Frazier notes, gentrification is not revitalisation. What’s happening in Partick, Durham, London, New York and everywhere in between is not being done for the benefit of the communities that have called those areas home for generations. It is being done to attract a different sort of person to the area – richer, younger, whiter. Gentrification alienates people from their own communities – removing the landmarks they once frequented, increasing the cost of living, and driving people out. These strategies are just as nefarious as direct eviction but more difficult to parry into individual accountability. Oral historians are duty bound, in Frazier’s eyes and mine, to record these local histories - of shipbuilders, mothers, business owners - preserve them and pass them on. Like the Marion Cheek Jackson Oral History Project, we can also then use those stories as a way to mobilize Partick residents to fight back against displacement and educate incoming residents about how the area wasn’t always the home of young, hip professionals. For Partick, I have no doubt that when I go back in June something else will have changed – let’s hope I still recognize my Dear Green Place. Rebecca McGilveray is the first Scottish OHMA student. Her interests include conducting oral histories of gentrification, displacement and deindustrialisation in her home city of Glasgow. She is also a research assistant on the Mott Haven Oral History Project. She loves studying at OHMA and refining her practice as an oral historian.